So we have weekly drawing challenges in an art group I'm apart of. This last week I just couldn't resist, and of course because this is me she has a backstory. Whiskey Sierra was one of the last Mark 3 Jaeger's deployed before the switch to Mark 4s in late 2017. It held an impressive 14 kill rate under its belt before being ripped in two by a category 4 Kaiju named Goblin. It was the third and longest deployed out of five "Sierra" Jaegers to protect the Northern California coastline after the fall of San Francisco. The area itself had an abnormally high turnover of Jaegers due to it being a "hot spot" as it was closer to the portal than most other cities. The first two, Sierra Delta and Sierra Charlie, were built in Washington at the Boeing factory and protected the Bay Area as San Francisco, Oakland, and Silicon Valley were rebuilt behind a large wall that was called "The Wall of the North" (it would be connected with sections of the Wall of Life later on). 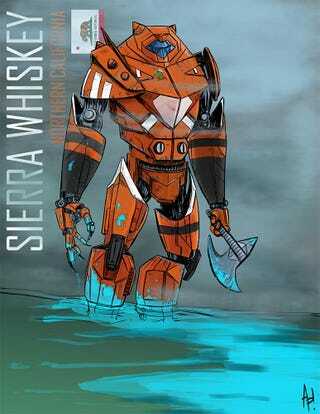 Sierra Whiskey itself was a joint effort build by the many Silicon Valley tech companies coming together and pouring their collective resources together to construct a Mark 3 before Charlie could no longer handle the strain of category 3s. Built at the NASA Ames research facility in Mountain View, Whiskey was given a paint job to honor the Golden Gate Bridge. She was said to be "Bay bred and raised", and was a source of NorCal pride. Upon deployment, Whiskey briefly served alongside Charlie before Charlie was retired after a fight that damaged her nuclear core. A year after she was built she was given a new partner, Sierra Bravo, whom she outlived after a system glitch made Bravo lockup during fight. Whiskey was deployed long enough to see the final of the Sierra series, Sierra Alpha, launched before falling in combat. There were several features Whiskey Sierra was known for. Retractable alloy claws on its fingertips to better grip a kaiju, "hind claws" that were actually spikes on it's feet that drove into the earth for better footing, electrified tesla spikes on its hood and right shoulder to fry a kaiju attempting to bite at its more vulnerable areas, and last but not least, a retractable ax that was stored on its left hip that was nicknamed "The Bite". The Bite could cleave through most category 3's with no more than a few swings. A signature move of Whiskey was to grab a Kaiju with its claws and pull it close, then swing The Bite up underneath the Kaiju, disemboweling it. More affectionately known on it's home turf as "The Bear" due to the extended hood, and Tesla spikes on the cowl, the unintentional design and pilots made it an unofficial mascot of the LGBTQ community. Whiskey eventually served as the grand marshall of the 2018 San Francisco Pride Parade. It stood in the water off of the Embarcadaro and waved a an enormous rainbow flag. The Wall of the North is adorned with graffiti art of all of the Sierra Jaegers, but the Sierra Whiskey stencil art it the most ubiquitous with Northern California and has spawned a line of successful t-shirts.